Open-E JovianDSS is a ZFS- and Linux-based Data Storage Software designed for enterprise-sized Software Defined Storage environments. With its features, the product ensures highest data reliability and integrity for optimal data storage, protection and recovery. It addresses the needs of enterprise users seeking a unified NAS and SAN solution with thin provisioning, compression and deduplication. The software uses shared storage for HA storage environments, and is the answer to almost any storage requirement: either as a single node, a virtualized HA setup or a Big Data cluster environment. It delivers a full-service, Software Defined Storage package that can be flexibly customized. Off-site Data Protection is a special feature of Open-E JovianDSS that provides a strategy for Backup, Archiving and Disaster Recovery by enabling asynchronous replication to local sites or co-locations. This way, servers with crucial data can be easily and instantly restored in case of an unexpected disaster. The functionality allows creating consistent snapshots with asynchronous replication of snapshot deltas to local or remote destinations. Additionally, replication tasks can be scheduled according to the specific user requirements for secure archiving. Encryption enhances security even further while buffered data replication significantly increases the efficiency of storage environments with Open-E JovianDSS. The functionality can be managed via the Command Line Interface (CLI). 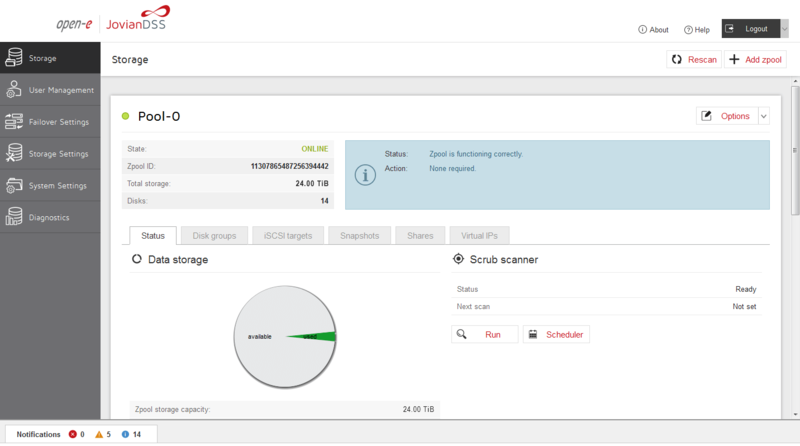 The software also includes VMware vSphere Storage APIs - Array Integration (VAAI) for iSCSI data acceleration. Off-site Data Protection in Open-E JovianDSS effectively prevents data loss and minimizes the recovery time with fast Disaster Recovery, and allows setting up an application-consistent backup with a retention interval as a Disaster Recovery plan for virtual environments based on VMware. The software does not require the installation of any backup agent. This site does not contain serial number, crack, keygen Open-E Jovian Data Storage Software (JovianDSS) serial number : serial number is the simplest type of crack. A serial number(cdkey,product key,etc) is register the program as you may already know. a crack or keygen may contain harmful software. If you cannot find the exact version you want, just give it a try. for more information read .nfo/.txt/.diz file include in zipped file.